Got an ISO or IMG disc images to burn to physical CD or DVD disc? In Windows Vista, XP or Windows Server 2003 and 2003, users have to download and install free utility such as ISO Recorder or BurnCDCC, and other commercial software such as Nero, Alcohol 120% and etc. In Windows 7, the disc image burning capability is built-in. Windows 7 has built-in Burn Disc Image Burning Tool to burn and write an ISO or IMG image file to a CD or DVD disc image. The best thing about the built-in Burn Disc Image Wrting Tool is that it’s simply very easy to use as it’s tightly integrated with Explorer shell. Insert a blank unused CD or DVD disc into the CD or DVD writer drive. If you don’t put in a blank disc, the utility will auto eject the disc tray before start burning. Locate the ISO or IMG image file that wants to burn to physical disc. Right click on the disc image, and select Burn disc image, or alternatively, simply double click on the disc image file. 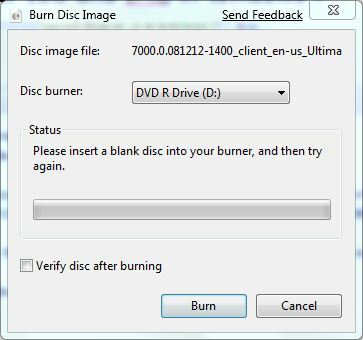 A “Burn Disc Image” dialog window will open. Select the CD/DVD writer or burner drive to use in the drop down list of Disc burner for user with multiple burners. If you want to verify that the burning process is done properly, check and tick the Verify disc after burning checkbox. Click on Burn button to start creating the CD/DVD from the image file. When disc creation process is done, click on Close button.